The recommended servicing need to be accomplished at regular intervals. Need to perform a cautious scrutiny of all parts. Cleaning of the saw and connected equipment. Quickly addressing of the problems and faults found. When needed organizing for professional repairs. In case, any components become faulty, mainly any safety devices, you must not operate the saw. Chainsaws are available in petrol power for light trimming as well as heavy cutting. However, purchasing the right chainsaw for your precise use is of prime importance. Refer to our chain saw buying guide to identify your chain saw use. To stop the entry of foreign matter, apply the choke to shut off the carburettor throat, prior to removing the filter. To detect damage and infiltration of foreign matter, take out and check the filter. In case, the filter is damaged, replace it and clean as per manufacturer’s instruction. It’s highly suggested that a spare filter be kept so that it can be used as a replacement when need be. Saw body, air intake vents and cooling fins must be carefully cleaned. In order to prevent damage to the paintwork and possible corrosion, you need to use plastic or wooden scrapers instead of metal screwdrivers. Specifically, around brake band and operating mechanism, you must thoroughly clean. In order to keep the brake’s internal components free from amassing dirt and saw dust, repeated operation of the brake all through the day is necessary. Make sure of the right operation. Take outside cover, clean and inspect. To detect possible wear and cracks, you need to visually check chain and bar after removing the saw chain. Work from the nose backwards and clean out the groove. Remove burrs, if any. Oil holes need to be cleaned. Make sure sprocket rotates and scrutiny for broken teeth. To balance wear, reverse the guide (cutter) bar. Sharpen the chain after installing or install the spare chain. Several times during the day, it may be required to replace or sharpen the chain. For stiffness, check screws/ nuts. Don’t tighten up more than required. Ensure all safety devices are functioning properly. Reduce condensation of water in the tanks during storage by filling the tanks at the end of the day. In case, wear marks on teeth exceed 0.5mm, change after two chains or sooner. When changing sprockets, always clean crankshaft stub and needle bearing, and lubricate bearing. Take out, clean and scrutiny gap. Change as needed. Fuel tank - With 2-stroke mix, flush out any amassed saw dust. To make sure effective operation, repeated lubrication of the pivot or sliding surfaces is required. 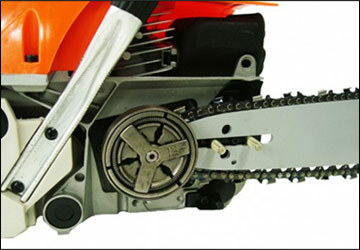 Take to a competent chainsaw mechanic for chain brake fine-tuning. Clean as required and inspect for maneuverability. Clean fan and the cylinder fins after taking out fan housing. For looseness and deterioration, examine springs/ rubber mountings. Take out and clean the spark arrester when the engine performance starts to decline. The spark arrester must be safely fixed always. It is highly recommended to refer to a dealer/ service person for the most modern chainsaws that require a digital tachometer for tuning. Within the first 20cm, the most common point of cord wear is. Examine the starter cord for possible rupture and change it if required, so as to avoid breaking up while on the job. We recommend the 25.4cc Petrol Chainsaw 10" Oregon Bar & Chain Heavy Duty, Powerful Chain Saw, which has been made utilizing the finest components and is designed to last in Australia’s harsh conditions. Made for cutting small logs and saw timber, this is one of the best chainsaws in the market. Also, felling small trees and trimming tree branches can be done with it and it is now available with high quality OREGON® chain and bar. Motor starts, runs well but loses power after two or three cuts. It will pick up again after a brief rest but the condition worsens rapidly. Motor starts and runs well but will not continue to idle with throttle in idle position. Speed of motor gradually increases until motor is racing. Replace gasket. If fuel pump body is warped, replace. Motor runs well but loses power at certain angles. a) Place saw over log with exhaust port facing down and choke in off position. Hold throttle wide open and pull starter. b) Set choke to running position, turn off ignition. Remove and dry out spark plug. Ensure spark plug lead is earthed and briskly pull starter rope to blow out fuel. Replace spark plug. Motor starts, will not idle but runs at very high speed. Motor starts, idles but will not accelerate to full speed. Motor starts, idles and appears to run well, but lacks power. Bring piston to top dead centre. Clear carbon from port using wood scraper. To test: remove starter assembly and turn motor by hand in forward and reverse direction. Higher compression in reverse indicates worn rings and/or cylinder. Motor idles but chain continues to move. Motor idling speed can only be obtained with mixture settings very different from specification. Damage to adjustment screws by screwing too tight. Jet seats likely damaged also.